TL;DR: Biorisks could result in extinction because of multipandemic in near future and their risks is the same order magnitude as risks of UFAI. A lot of biorisks exist, they are cheap and could happen soon. It can’t be explain by the fact that biorisks have smaller probability (it will not be known until Bostrom will write the book “Supervirus”). I mean we don’t know it until a lot of research will be done. Also biorisks are closer in time than AI risks and because of it they shadow AI risks, lowering the probability that extinction will happen by means of UFAI, because it could happen before it by means of bioweapons (e.g. if UFAI risk is 0.9, but chances that we will die before its creation from bioweapons is 0.8, than actual AI risk is 0.18). So studying biorisks may be more urgent than AI risks. There is no technical problem to create new flu virus that could kill large part of human population. And the idea of multi pandemic - that it the possibility to release 100 different agents simultaneously - tells us that biorisk could have arbitrary high global lethality. Most of bad things from this map may be created in next 5-10 years, and no improbable insights are needed. Biorisks are also very cheap in production and small civic or personal biolab could be used to create them. May be research in estimation probability of human extinction by biorisks had been done secretly? I am sure that a lot of analysis of biorisks exist in secret. But this means that they do not exist in public and scientists from other domains of knowledge can’t independently verify them and incorporate into broader picture of risks. The secrecy here may be useful if it concerns concrete facts about how to crete a dangerous virus. (I was surprised by effectiveness with which Ebola epidemic was stopped after the decision to do so was made, so maybe I should not underestimate government knowledge on the topic). I had concerns if I should publish this map. I am not a biologist and chances that I will find really dangerous information are small. But what if I inspire bioterrorists to create bioweapons? Anyway we have a lot of movies with such inspiration. So I self-censored one idea that may be too dangerous to publish and put black box instead. I also have a section of prevention methods in the lower part of the map. All ideas in the map may be found in wikipedia or other open sources. The goal of this map is to show importance of risks connected with new kinds of biological weapons which could be created if all recent advances in bioscience will be used for bad. The map shows what we should be afraid off and try to control. So it is map of possible future development of the field of biorisks. Not any biocatastrophe will result in extinction, it is in the fat tail of the distribution. But smaller catastrophes may delay other good things and wider our window of vulnerability. If protecting measures will be developed on the same speed as possible risks we are mostly safe. If total morality of bioscientists is high we are most likely safe too - no one will make dangerous experiments. Timeline: Biorisks are growing at least exponentially with the speed of Moore law in biology. After AI will be created and used to for global government and control, biorisks will probably ended. This means that last years before AI creation will be most dangerous from the point of biorisks. 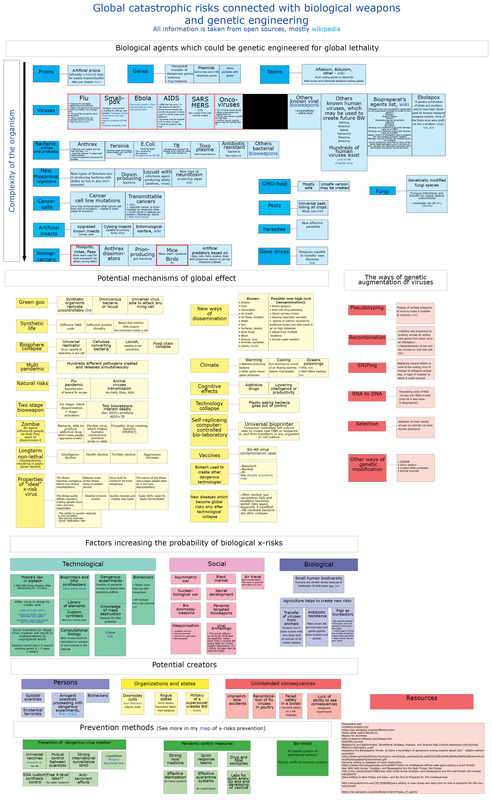 The first part of the map presents biological organisms that could be genetically edited for global lethality and each box presents one scenario of a global catastrophe. While many boxes are similar to existing bioweapons, they are not the same as not much known bioweapons could result in large scale pandemic (except smallpox and flu). Most probable biorisks are outlined in red in the map. And the real one will be probably not from the map as the world bio is very large and I can’t cover it all.